My final giveaway for my birthday month is sponsored by Leora from Shutter Buddies! Man, I really wish I could win this one for myself. I'm a stay at home mom to three amazing kids. I enjoy making my Etsy products to keep me busy while my husband serves in the Army. I enjoy making products that can be used by photographers to make their pictures perfect. I also enjoy making products for their subjects so they can look perfect in the pictures. 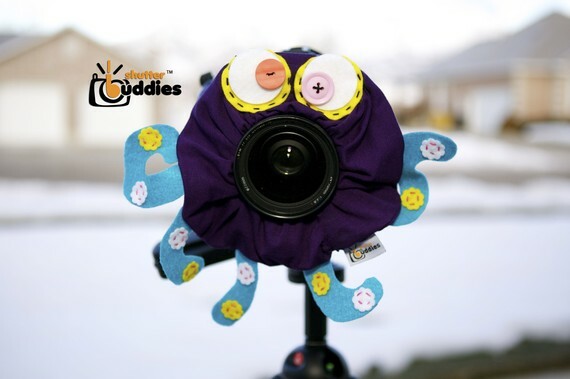 Leora is giving away one of her shutter buddies picture below known as Oscar Octopus! Please leave one comment PER entry to increase your chances of winning! Mandatory Entry: Visit Leora's shop and tell me which of her shutterbuddies you like the best. You have through Saturday to enter. Winners will be randomly selected via Random.org and the winner will be contacted via e-mail. Thank you once again to all my wonderful sponsors and to you who participated in my month long birthday giveaways! Look for more giveaways in December from yours truly. Now I like Shutter Buddies on Facebook. I definitely need one of these! :) I couldn't find a link to the shop anywhere (the button over in your sponsor section didn't seem to be working), but I looked on FB and I like the green 4-eyed monster! Reminds me of A's halloween costume! I love so many of them, but Randy Raptor makes me smile, so if I MUSt choose just one, let it be Randy. Any of them would be fantastic!